This article first appeared in The Edge Financial Daily, on December 28, 2016. KUALA LUMPUR: After another year of underperformance by Malaysia’s equity market in 2016, local investment banks are looking ahead with cautious optimism amid expectations of an early 14th general election (GE14) in 2017, prompted by the “anytime soon” hint by Prime Minister Datuk Seri Najib Razak during the Umno General Assembly early this month. The local market has been dealt some bad cards in 2016, including the Chinese market collapse, the Brexit (UK leaving the European Union) shock wave, Donald Trump’s US presidential win and a tumbling ringgit. With these headwinds, it is hardly surprising the FMB KLCI is down for the third year in a row, with core earnings growth remaining lacklustre. Investment managers do not expect any marked turnaround in 2017. “Although we see things beginning to improve, we continue to be underweight on Malaysia given that there are more competitive countries in the region and other parts of the world, and insufficient economic structural reform here,” said Steven Moeller, managing director and head of multi-asset platform strategy for Asia-Pacific at investment management corporation BlackRock. “We still need to see certain structural reforms happen in Malaysia before we could move to an overweight position,” Moeller told The Edge Financial Daily. Moeller’s comments perhaps reflect the current environment where foreign investors are net sellers for the third year. After Trump’s win, foreign investors have pulled out about RM4.3 billion from Malaysia equities, reversing their position to that of a net sell of about RM2.5 billion as of Dec 14, from a net buy in the first 10 months. Still, the outlook for the Malaysian equity market is not all doom and gloom, with the possibility of an early GE14 providing some hope of a recovery in share prices. Maybank Investment Bank, in its report dated Dec 19, said an early GE14 could lift sentiment and spur spending, benefiting many segments including construction and consumer-based sectors, amid uncertainties triggered by the external environment. External risk events that could trigger the volatility in the market include fiscal expansion plans in the US under Trump, which could lead to higher inflation and growth expectations, triggering more aggressive US Federal Reserve rate hikes, widen further monetary divergence between US and other major economies, as well as the “anti-European Union” sentiment with major elections in Europe. There are also potential protectionist trade policies in the US and China’s reaction to these potential policies to reckon with. The report highlighted sectors such as utilities, real estate investment trust and construction as overweight. It also mentioned the risk-reward outlook for the oil & gas (O&G) sector has improved and believes it has seen its bottom following the recent Opec-led deal in reducing oil output. Public Investment Bank, in its market strategy report for 2017, also talks about the opportunities for long-term investors amid the quiet market. “We concede it’s still hard to get overly excited about market conditions in the immediate term, but we do see the current period of relative lull being an opportune time for accumulation of undervalued stocks for the longer term especially if there are fresh bouts of weakness from foreign-led hot money outflows,” it said. 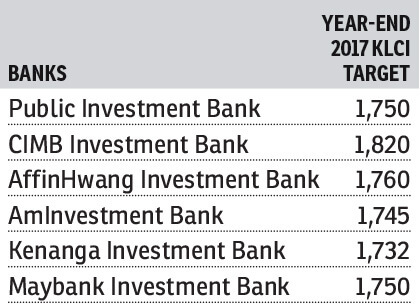 Public Investment Bank also shared that the index has always ended up higher than where it was 18 months prior to the general elections in the past, based on the market movements over the last six elections in Malaysia. “Our  year-end target is 1,750 points, and suggested stocks for the year are Genting Plantations, Kossan Rubber, Chin Hin Group, Ta Ann Holdings, SCGM, Sime Darby, SapuraKencana Petroleum, Wah Seong Corp, LBS Bina. We are overweight on the plantations, power, O&G and construction sectors,” it said. CIMB Investment Bank, offering the most bullish view on the equity market in 2017, said in its research report dated Dec 2 that investors should go for US dollar beneficiaries and defensive plays. “We revised down our end-2016 [FBM] KLCI target from 1,730 to 1,710 and end-2017 [FBM] KLCI target from 1,880 to 1,820 to reflect weak earnings, but still based on a higher three-year average price-earnings ratio (PER) of 16 times vs 15.6 times. We like construction, utilities and select US dollar beneficiaries,” it said. Affin Hwang Investment Bank, meanwhile, remains positive on Malaysia for 2017 as its assessment indicates the country will be able to manage reasonable foreign outflows from the bond and equity markets. But it warned that the risk of contagion has risen. “Valuation has become more attractive with the ringgit being undervalued,” it said in a report dated Dec 2. 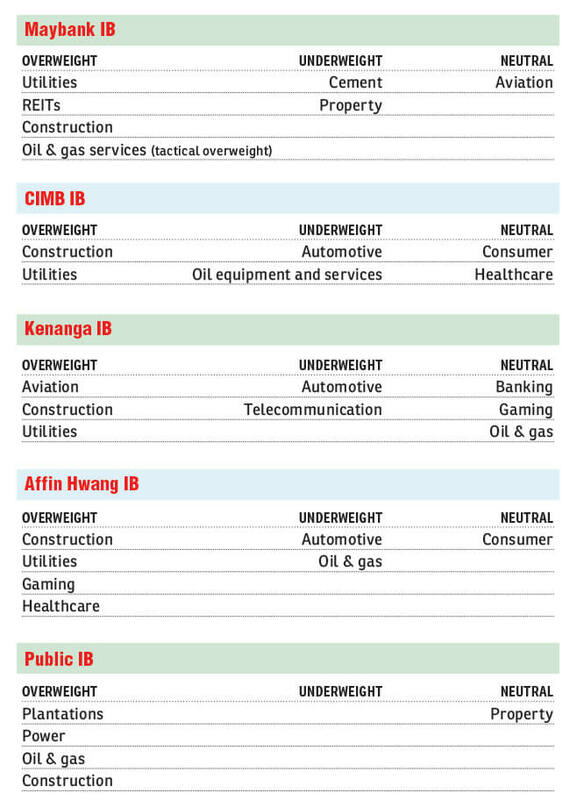 Affin Hwang Investment Bank did not make any changes to its FBM KLCI index target of 1,760 for end-2017 and expects the three largest contributors of growth to be financials, consumer and telecoms, and the three biggest drags being gaming, transportation and plantation. Kenanga Investment Bank has also lowered its end-2017 index target to 1,732 from 1,755, with an unchanged PER target of 16 times to its revised earnings estimate. Kenanga Investment Bank, in its Dec 2 report, also mentioned that oil prices have shown signs of improvement and “with a strong rebound in crude oil prices, we believe [the] O&G sector would be a ‘dark horse’ in the making”. Inter-Pacific Securities agreed that the oil sector could see a slight recovery with stronger prices but pointed to several concerns. “The problem with the listed companies in the oil sector in Malaysia is that there aren’t many major producers, and most are involved in the support services that are still pressured by overcapacity,” its head of research Pong Teng Siew told The Edge Financial Daily. Pong, however, was more positive on the FBM KLCI outlook, citing plantations as one of the sectors that are likely to see an upcycle trend. He expects demand to continue to go up and prices to sustain a gradual uptrend. “Most of the negativity surrounding the [FBM] KLCI has been priced in the market this year. It does look like there is a silver lining as we move into 2017,” Pong added. He expects the benchmark index to see an upside of about 50 to 100 points by end-2017.